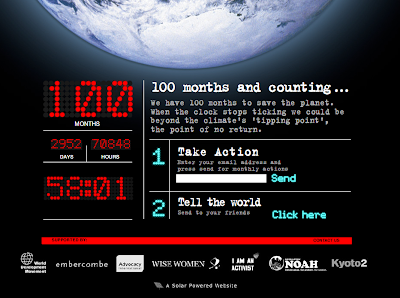 We have a hundred months to save the planet. When the clock stops ticking we could be beyond the climate's 'tipping point', the point of no return, so says the Green New Deal report just published today by the New Economics Foundation. onehundredmonths.org has just launched today - I'm supporting it, Wise Women are supporting it, and I hope you will too. 75 years since President Roosevelt launched a New Deal to rescue the US from financial crisis, a new group of experts in finance, energy and the environment have come together to propose a ‘Green New Deal’ for the UK. * Executing a bold new vision for a low-carbon energy system that will include making ‘every building a power station’. * Creating and training a ‘carbon army’ of workers to provide the human resources for a vast environmental reconstruction programme. * Establishing an Oil Legacy Fund, paid for by a windfall tax on the profits of oil and gas companies as part of a wide-ranging package of financial innovations and incentives to assemble the tens of billions of pounds that need to be spent. These would also include Local Authority green bonds, green gilts and green family savings bonds. The monies raised would help deal with the effects of climate change and smooth the transition to a low-carbon economy. * Ensuring more realistic fossil fuel prices that include the cost to the environment, and that are high enough to tackle climate change by creating economic incentives to drive efficiency and bring alternative fuels to market. This will provide funding for the Green New Deal and safety nets to those vulnerable to higher prices via rapidly rising carbon taxes and revenue from carbon trading. * Minimising corporate tax evasion by clamping down on tax havens and corporate financial reporting. A range of measures including deducting tax at source for all income paid to financial institutions in tax havens would provide much-needed sources of public finance at a time when economic contraction is reducing conventional tax receipts. * Re-regulating the domestic financial system. Inspired by reforms implemented in the 1930s, this would imply cutting interest rates across the board– including the reduction of the Bank of England’s interest rate - and changes in debt-management policy to enable reductions in interest rates across all government borrowing. This is designed to help those borrowing to build a new energy and transport infrastructure. In parallel, to prevent inflation, we want to see much tighter regulation of the wider financial environment. * Breaking up the discredited financial institutions that have needed so much public money to prop them up in the latest credit crunch. Large banking and finance groups should be forcibly demerged. Retail banking should be split from both corporate finance (merchant banking) and from securities dealing. The demerged units should then be split into smaller banks. Mega banks make mega mistakes that affect us all. Instead of institutions that are ‘too big to fail’, we need institutions that are small enough to fail without creating problems for depositors and the wider public. * Allowing all nations far greater autonomy over domestic monetary policy (interest rates and money supply) and fiscal policy (government spending and taxation). * Setting a formal international target for atmospheric greenhouse gas concentrations that keeps future temperature rises as far below 2°C as possible. * Giving poorer countries the opportunity to escape poverty without fuelling global warming by helping to finance massive investment in climate-change adaptation and renewable energy. Hello! I just wanted to say that I really appreciate your blogging! I actually have an environment-focused blog myself, and maybe you could check it out if you have time? Thanks! Very interesting to read your comments about college campuses - I look forward to reading more of your posts. Good luck with the eco-blogging!